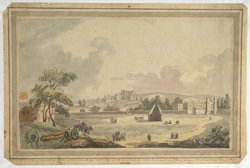 View of Westminster from the time of Charles I, taken from fields where Piccadilly now stands. The original drawing was made by Wenceslaus Hollar in c.1625-1649, and is now in the Royal Collection at Windsor. This is a copy made in 1780 by an unknown artist. A key explains the significant places and buildings: No.1 part of the village of Charing, No. 2 the Clock Tower in Palace Yard, No.3 Westminster Hall, No.4 the Abbey before the Towers were built, No.5 the Stone Conduit now St James's Square, No.6 a convent, now St James's House.